I don’t usually respond to random sales pitches that drop in my inbox. I get 100s of offers every week but I’m a total snob about which news makes it onto SUPracer.com. Either way, today I came across a press release that did make me stop and take notice. And while I won’t copy & paste the whole thing, I am more than happy to talk about what seems to be an awesome (and very much needed) new product. Or in layman’s terms: You can blow up your inflatable SUP way quicker with this thing. The official spiel goes on to quote a maximum air speed power output of 62mph, which is apparently double what other pumps give you. I have no idea how you measure air speed power output (I didn’t even know it was a thing until today), but 62mph for a little plastic pump sounds mighty impressive. To give you an idea of just how much faster the Titan Pump is, the Red crew compared their latest creation to other pumps on the market, including their own original models. And the results are pretty clear. 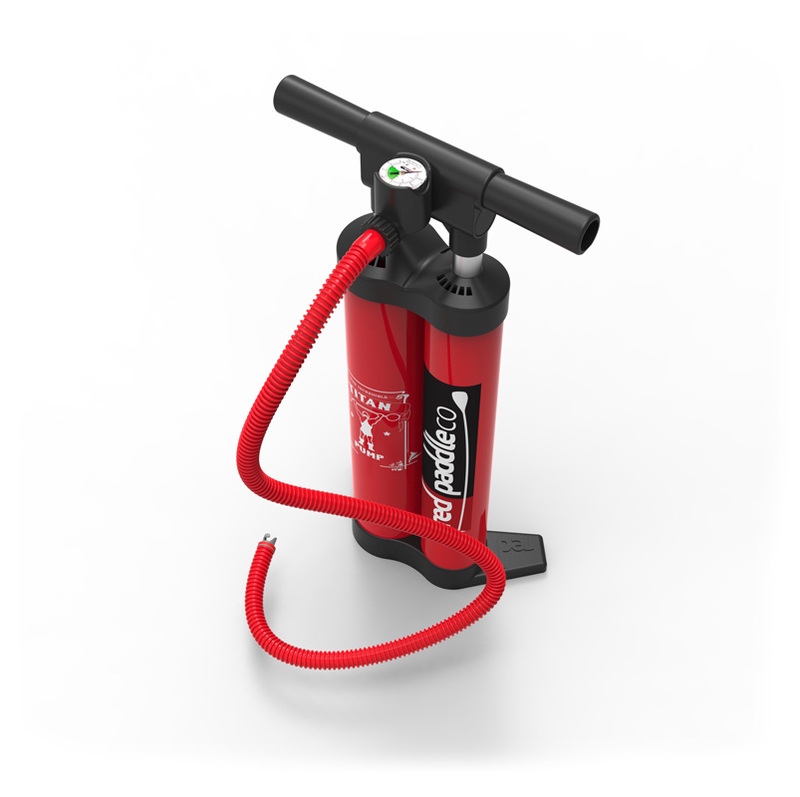 The Titan will inflate your board more than twice as quick as the normal pumps that most of us use (single action, high pressure pumps). Though surprisingly, the Titan is more than 50% quicker than the new-generation dual action pumps as well. These dual action pumps inflate the board when you both push down and pull up on the pump handle. I only saw them for the first time last year and thought they were pretty cool, but apparently the Titan is on a different level altogether. And as further evidence, below is a side by side video comparison of the three different pumps. That guy in the middle sure looks lonely (and tired) by the end of the clip. At the 26 second mark you can see Titan’s other nifty little trick: The ability to switch from high volume to high pressure pumping, which makes it even easier to squeeze in those last few psi (the key to making the your inflatable board stiff and rigid). Red’s philosophy behind creating the Titan was that we all want to spend less time getting ready and more time out on the water enjoying the actual paddling. And it’s hard to argue with that sentiment. Now at this point, you might be asking yourself how I’ve managed to write 500 words about a freakin’ pump. But if you’re asking yourself that then you’ve clearly never had to inflate a stand up paddleboard. Either that or you’re just a really patient person (and/or enjoy an insane arm workout before each paddling session). Pump really hard for two minutes. Take a break. Pump really hard for one minute. Take a break. Pump really hard for 30 seconds seconds. Take a break. Pump really hard for 10 seconds and then say “Screw it! That’s good enough…” before proceeding to paddle off on a very flimsy board. As inflatables become a bigger and bigger part of the SUP market, and as they creep into the racing scene more and more, these kind of accessories will become more useful than ever. Like I wrote the other day in my quick review of Starboard’s Astro Racer Inflatable, the technology of blow-up SUP boards, particularly race boards, is rapidly improving. While carbon designs are still faster (and cooler), I don’t think their plastic cousins are all that far behind. And the gap is narrowing. 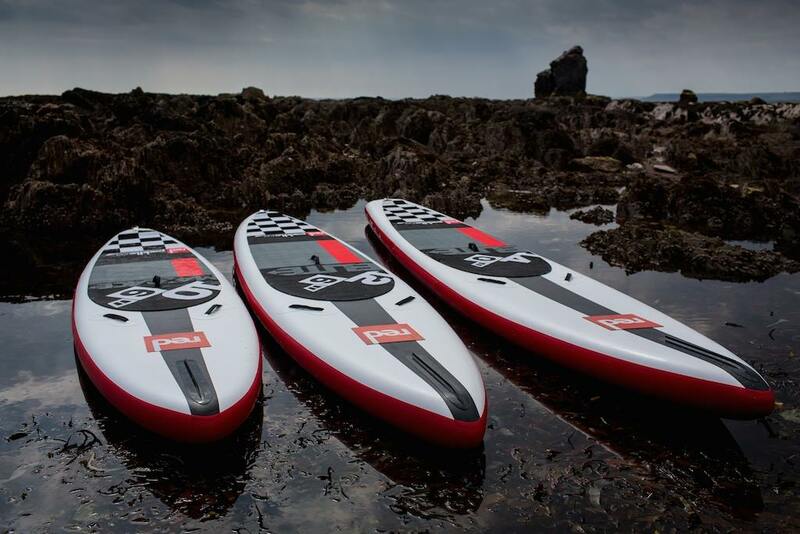 Red Paddle Co. is one of the original inflatable SUP board manufacturers. Some say they are THE original brand. I don’t have the Illustrated History Of Inflatable SUPs in front of me right now but I do know Red has been making blow up boards for as long as I can remember. And the thing about Red is, they *only* make inflatable stand up boards, which means all of their focus is on this one segment of the industry. While some traditional hard board makers have invested a lot into their inflatable programs on the side (Starboard and Mistral spring to mind as two quality blow up brands), it’s always going to be hard to surpass a company that focuses on the niche 100%. In this way, the UK-based Red Paddle Co. is similar to their U.S. counterpart ULI board. So anyway there you go. 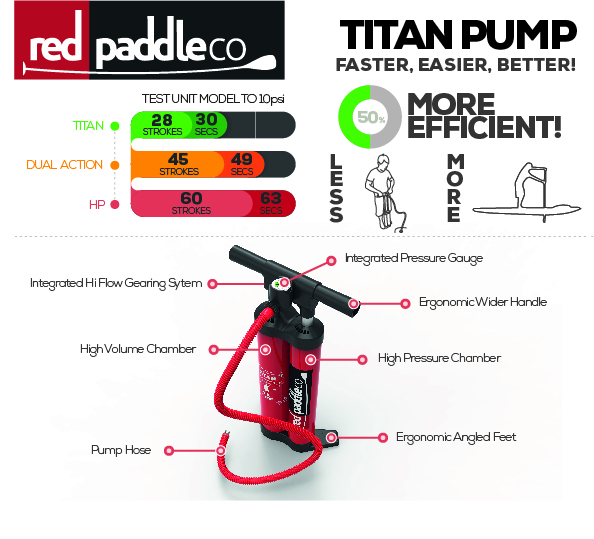 The Titan Pump from Red Paddle Co. Looks pretty sweet.